Place eggs in single layer in 2-quart saucepan. Cover with cold water at least 1-inch above eggs. Cover saucepan; heat to boiling. Immediately remove from heat; let stand covered 15 minutes (12 minutes for medium and 18 minutes for extra-large). Drain. Immediately place eggs in cold water with ice cubes or run cold water over eggs until completely cooled. To peel, gently tap egg on countertop until entire shell is finely crackled. Roll gently between hands to loosen shell. Starting at large end, peel egg under cold running water to help remove shell. Coarsely chop eggs and place in medium bowl. Stir in mayonnaise, salt and pepper. Stir in ham and onion. Spread egg mixture on each of 2 slices toasted bread. Top with remaining bread. 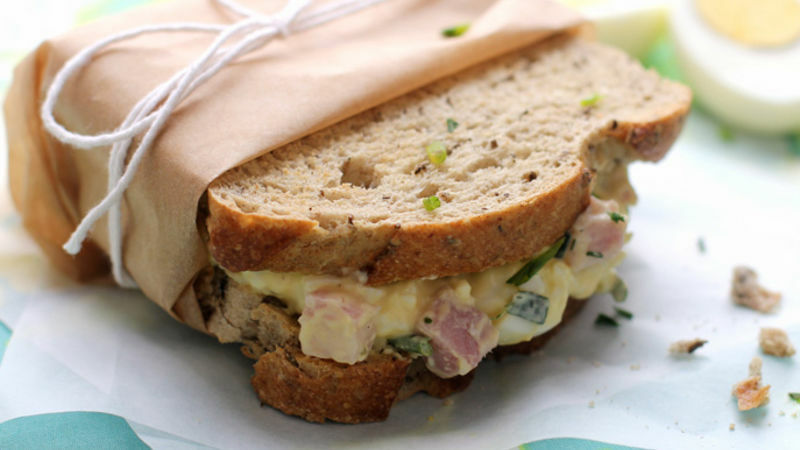 Don’t want to serve your egg salad right away? No problem! It will store in the fridge in an airtight container for up to 2 days.